When you hear the term record label, what thoughts spring to mind? To many, they think of big business, labels that buy and sell bands like they are stocks, and executives that will cut deeply into an artist’s revenue with the ferocity of Freddy Krueger. While this may be true in some cases, particularly a reputation that the major labels would have a difficult time shaking, there are several labels that don’t follow this stereotype. It seems weird to think about it, but there are an assortment of record labels out there that actually have their own personalities. Ones that, at least at one point in their existence, existed as projects of passion, with music coming first and business coming second. I thought I’d start a series where I put a bit of focus towards record labels that aren’t one of the big boys (Epic, Sony, Warner Bros., and other giants that have likely merged by now). Sackville Recordings is as unique a place to start as any label past or present. In my years of music collecting, I’d never associated Canada as a place where record labels come from, never mind one that specializes in jazz. Sure, there are enough music exports from the Great White North to please even the most critical of listeners, but the country seems the place where artists get their start with hopes of finally making it south of the border or across the pond. It turns out that Sackville Recordings was quite the little success story without needing to migrate to a more typical setting like New York or Paris. I first heard of this label during a dig through the record bins when discovering an album by percussionist Barry Altschul. From what I can recall at the time, all I owned that featured his playing was Dave Holland’s Conference of The Birds album and a recent solo album of his, The 3dom Factor. I was in the midst of my reliable technique of looking into lineups on jazz albums and exploring musicians’ discographies when deciding to set a goal of obtaining more of Altschul’s work when searching for music. Since there aren’t too many avant-garde jazz fans in our area, let alone jazz fans, my brother and I often get the pick of the litter and score some excellent finds while record shopping. When finding a sealed copy of Altschul’s Brahma, liberating seven dollars from my wallet was a no-brainer. Thinking a bit more about this, my brother grabbed a rather enjoyable Ed Bickert & Don Thompson duet album, At The Garden Party, which was on Sackville, but it wasn’t until I acquired Brahma that I got a better idea of the scope of the record label. As a brand new record, it contained a four-page catalogue highlighting other releases from the label. It’s the type of thing most people toss in the trash after opening a record up, but puts a smile on the faces of collectors looking to make yet another purchase down the road. One nice touch is that each record’s tracks are listed completely, useful for those that are looking for fresh takes on classic standards like ‘Sweet Georgia Brown’, ‘My Funny Valentine’, or ‘In a Sentimental Mood’. The level of name recognition should be fairly high for jazz fans. If you are into the AACM or Black Artists Group scenes in particular, you’ll find several of these peers have contributed music under the Sackville label. Anthony Braxton, George Lewis (author of the comprehensive A Power Stronger Than Itself: The AACM and American Experimental Music), Roscoe Mitchell, and Oliver Lake are among the roster of artists. Looking past the avant-garde side of jazz, Sackville also seemed to feature a number of artist who performed in the context of big band, swing, or bluesy stylings from the likes of Bill Holman, Jay McShann, Buddy Tate, and Dollar Brand (aka Abdullah Ibrahim). Jazz artists, in contrast to pop or rock artists of the day, seemed to have the freedom to jump labels with greater ease. Sackville seemed to be a label where musicians weren’t locked into multi-album contracts, so a number of artists that graced this label were only around for an album or two. Although not shown in my catalogue, saxophonist Archie Shepp was among those contributing a single album to Sackville. 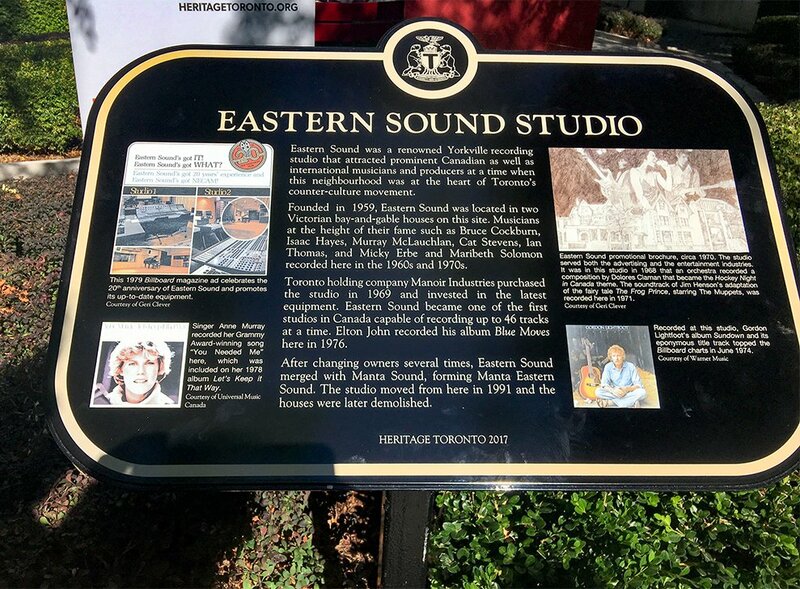 A deeper look at some of the album reveals that many of them were actually recorded in Toronto-area studios. These locales included Thunder Sound and Eastern Sound Studio, with live recordings being captured at A Space and Bourbon Street. It’s sad to see that most of these places have been demolished, not exactly surprising as there’s not much money in the music industry to justify having so many studios. The A Space gallery is still open. While I’ve never been there, I did see guitarist Ben Monder perform in a studio inside the same art building in 2015 (Musideum, which has since closed it’s doors). Visits to record stores in the months that followed the Brahma purchase resulted in finding two more Sackville releases: Of Blues and Dreams by Anthony Davis (not to be confused with the uni-browed basketballer), and Pick a Number by Bill Smith (for another needless sports reference, not to be confused with the short-tempered hockey goalie). Like the Altschul record, both were rather affordable. I don’t think I spent any more the five dollars on either one. There’s not all that much information about Sackville Recordings available on the internet. The label was formed by CODA Magazine founder John Norris and the aforementioned clarinetist Bill Smith in 1968. While the label doesn’t exist today (Norris passed away in 2010), the distribution rights were acquired by Delmark Records, who offered some of the first re-releases of these albums in five decades. Rather than lift from existing sources, listed below are a number of informative links I’ve discovered regarding the label, and I’m hoping to locate more. I may not jump up and buy every single Sackville release I stumble across on vinyl, but the name will always give me pause whenever it catches my eye. I’d recommend to any jazz fan out there to be on alert as well. You may just find an unexpected gem for your collection.